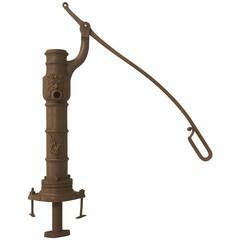 This Antique fountain was removed from the backyard of a home built in 1886 and appeared to be there since new. 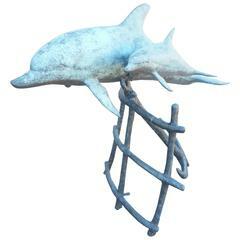 The fountain is a bit of a mix; we believe everything but the bowl, that hold the water is quite old. However, somewhere in its lifetime, the bowl was replaced with a fiberglass unit and I have to tell you, that visibly it is impossible to tell. The rest of the antique fountain, I believe is made of crushed stone, in a composite of some sort. There is a part of me that thinks it is carved stone, but unless I was 100% positive, I do not want to list it that way. The fountain does have a patina, commensurate with something from the 1800s. In as found condition with no visible cracks. An original oil painting of the Chicago Skyline, purchased from Marshall Field and Company about 20 years ago. Not signed. 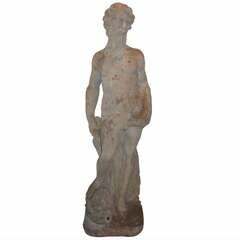 French garden fountain, garden sculpture, garden ornament or garden statue of poseidon. 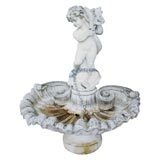 White cast stone putti holding a dolphin with shell basin on pedestal. 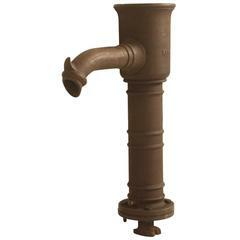 Aluminum garden fountain by FISK, circa 1920s Beautiful finish. A wonderful fountain from France.